Evernote is opening up development for its Chinese platform, called Yinxiang Biji, and has begun issuing the API and testing accounts to interested developers. The company’s China GM Amy Gu announced the news at a developer forum hosted by TechNode at Macworld Asia. Yinxiang Biji, which runs on Chinese servers separated from Evernote’s international ones, launched in May. Within days, the release lifted downloads from China “off the charts” and made the region the company’s fastest growing market. Growth appears to tapered some, though, as Gu reportedly said that China is now the second-fastest growth market for Evernote, ahead of Japan, but presumably behind the US. As of May, Evernote had more than 32 million users, up from 30 million in April and 20 million in December 2011. Earlier this year, the company raised $70 million at a $1 billion valuation to aid its expansion into China and other regions. Evernote is making a push to attract developers to its products. In March, the company launched a new developer site to invigorate the ecosystem. Evernote Trunk, the company’s application store, is believed to contain more than 12,000 apps worldwide. 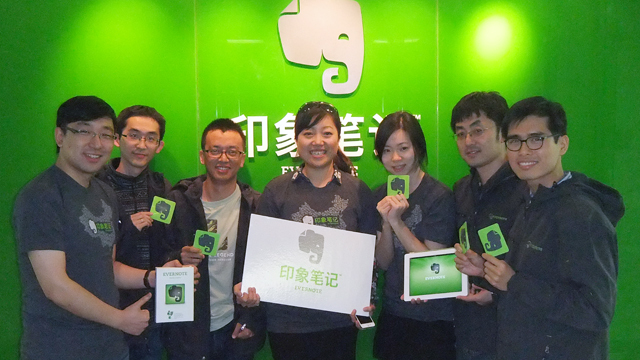 Of course, even with its focus on China, Evernote hasn’t neglected its international users. Recent updates to the Mac application have added account switching and an “Activity Stream“.